It’s still 3 weeks before my natal day but I feel like celebrating already! I now feel like singing for myself a “Happy Birthday” song. I’m just so happy, elated and ecstatic! Not because it’s almost my birthday but because it’s the biannual “All-Clad Factory Sale”. This is the most awaited time of All-Clad aficionados because this is the time when they’re selling the stuffs that they have much of, has been obsolescent or considered irregular. All of these come with the All-Clad warranty so no need to worry. Some might be anxious why these products are put on sale. If you think they are “junked” because of major flaws then you can breathe a sigh of relief because that is not actually the reason. It’s just due to minute details which the department store sees as a blemish that’s why they cannot display it like tiny scratch, off-centered logo or a minimal blotch. It still has the same high quality and durability which is the trademark of All-Clad. Every May/June and December, this All-Clad Factory Sale happens. I even joke around telling my peers that All-Clad intentionally scheduled their sale on these months especially for me because May is my birth month and December is Christmas which gives me the license to ask for gifts and I won’t want anything except All-Clad cookware. I giggly tell them that All-clad is just making it easier for them to buy their presents for me. Of course they won’t believe me and neither would you but still having All-Clad on sale is already a reason for celebration. You must now be sensing my infatuation for All-Clad products. I am really fascinated with the supremacy of the quality of their products. I always talk about it in my blog, over Twitter, Facebook, Pinterest and I even post positive feedbacks in All-Clad reviews. The All-Clad Factory Sale is happening on June 6, Friday from 9am to 7 pm and June 7, Saturday from 9am to 4pm. It will be held at Washington Country Fair and Expo Center. They are located at 2151 North Main St., Washington, PA. You can contact them at 724-225-7718. I have been to the sale for a couple of times already and I’m feeling generous to give out these helpful tips. You can pay via cash or credit card. Tag a friend who’s ready to help you carry the load of stuff you will buy. Friday is the best time to visit so that you could choose better before the items run out. It’s better to go as early as 6am because the line gets too long easily but if you would want you can also come in the afternoon which I usually do. UPS Shipping is also available if your car can’t carry all the items you bought. Note that the sale is not applicable to online ordering so you should personally visit the All-Clad factory store. Their personnel are amusing and eager to assist. Be ready to be amazed by their wide array of All-clad pots and pans and All-clad stainless steel set. Be charmed with their All-Clad Copper Core and All-Clad d5. You will really be dumbfounded with their vast selection of the finest cookware. Let me get this straight, I am not giving these optimistic feedbacks and comments for All-Clad cookware because I am connected to the company. I am not working for them. I am just giving an honest cookware review because I have personally tried their products and I am one satisfied customer. So now what more do you need to know about this awesome All-Clad Factory Sale? Like the previous sales that they had, they feature numerous individual pieces from the elegant All-Clad saucepans, All-Clad roaster to selections of utensils, crock pots, strainers, grill pans and the list goes on. They also showcase full sets like the All-Clad Stainless Steel set and the All-Clad Copper Core to name a few. 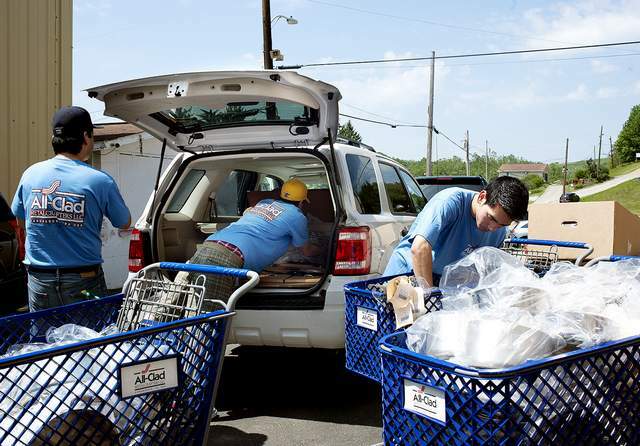 You also don’t have to apprehend of having to carry your stuffs to your car because they have ample of staffs who are ready to lend a helping hand to assist you. “Flash Sales” is one of the things you have to look forward to. You just have to remember to be polite to not run over other shoppers as they rush over the low stock items. With regards on how to clean the items, just be free to ask any of their staff. For sure it will really be a fun-filled and unforgettable day as you rummage through all those magnificent items. For more information you can just ask me or better contact All-Clad directly. The All Clad Cookware has been established in the year 1967. It has paved way for producing excellent quality materials used for cooking and frying pans and pots. From then on, it has gained popularity from anywhere due to the quality and the service it offers. Moreover, it reached its fame when world class chefs from five star hotels avail these All Clad Cookware sets for their very own kitchens in order to produce outstanding restaurant quality meals and dishes. Due to this phenomenon, a lot of home cooks, stay at home moms and even working moms made their way to look for these amazing and wonderfully made products from All clad Cookware Outlets and All Clad Cookware Factories. But because All Clad has the vision of making things easy for you, they set a website where you’ll be able to view the products, their individual specifications and lastly, how they’ll be able to be delivered right at your doorstep. As our modern information technology bloomed and flourished, the modes of examining, evaluating items as well as the method of purchasing and delivering products to your home have also been changed. 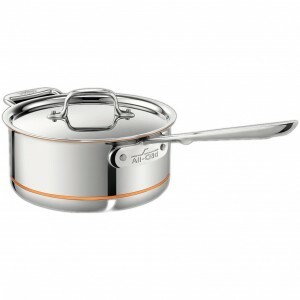 Nowadays, a lot of companies especially furniture, equipment, cookware and even fast foods have their own websites where customers can look up what products do they desire to buy and because of this, All Clad did the same too in order to make sure that you’ll have no trouble in locating where you can buy the finest and the best pieces of cookware. After you’ve been able to see the products offered by All Clad such as the All Clad d5, All Clad set, All Clad pans, All Clad pots and many others, you can now choose from the various mode of payment All Clad provides. You can choose to pay either by cash through money order, debit or credit cards, or by check. If you have credit or debit cards, it is advisable to avail the products which you had interest on through them, because it is the fastest mode of payment which results to faster delivery of cookware in order for you to start cooking superb dishes. If you are a cook, and you’ll be using the All Clad Cookware, then be enticed and excited to start cooking even more because through using these products you are ensured that you’ll be able to execute your kitchen talents and skills perfectly and wisely by bringing out dishes which are impeccable and sumptuous. 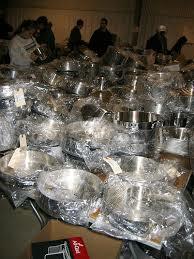 Through these pieces of cookware, you are assured that you’ll be delivering food which are even and rightly cooked. Also, it is made from materials such as durable steels which guarantee you that they’ll last long and the quality of cooking would never fluctuate and change. Every time you’ll cook, you’ll always feel that you are cooking with the brand new All Clad product. Likewise, you’ll have no trouble in keeping them clean and safe to use because they are made to dish washed and top cooked. As you have observed, All Clad is a brand which has been used by so many personalities and has proved that it is one of the finest, greatest, and most innovative cookware companies all around the globe that’s why it’s no longer a surprise why chefs from different regions are dying to get these products. Moreover, a lot of people got really impressed with these pieces of cookware from All Clad cookware reviews where all their latest products such as All Clad cookware stainless steel and All Clad cookware stainless steel sets have been featured and they received spectacular and positive comments and feedbacks from customers. These products can be bought from the internet if you have no time to visit the outlets. The products can be bought by set or individually. All Clad has been in this cooking industry for years, it has been able to innovate and set the bars higher for its competitors. It has been able to stand above the rest because of the quality and service they offer. They make all cooks either professionals or amateurs smile and enjoy cooking even more. Through these products, a lot of cooks who have low esteem were encouraged and motivated to fulfill their dreams and avoid having doubts in themselves so what are you waiting for? Google the online store of All Clad or visit its nearest outlet from your location and start cooking magnificently and confidently! When you are buying something from either supermarket or department store, you are always faced with a dilemma of whether buying an item with a cheap price, considering that when you but this item, you’ll buy a lot more or should you buy the expensive one which promises a higher quality performance but you’ll only be able to buy few items due to its remarkable price? This kind of situation often happens to a lot of customers all over the world especially when it comes to buying cookware. Cookware has been designed to deliver excellent food to the dishes of people and now as the market boosts with a lot of brands of cookware, people get confuse to what they should believe in, quantity or quality? Should you buy a cookware with a higher price than the regular one but you are ensured that you’ll be using it for quite a long time due to its durability and quality or should you buy the cheap ones, however, you are having doubts with their quality like would it deliver an evenly cooked food that your family would enjoy? If this has been your problem ever since you are visiting a kitchen store, then worry no more because in the All Clad Outlet Sale, you get All Clad Cookware andAll Clad Cookware Sets for an amazing price with assurance that they’ll be used for a long time with great and absolutely terrific quality performance. In this All Clad Outlet sale, you’ll be given the chance to purchase the kitchen stuffs you want for a very affordable price. You’ll be given a showcase a variety of products which would definitely make your kitchen a glow. 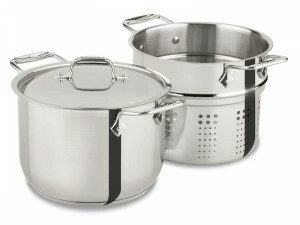 Some of these products are All Clad pot and pots, All Clad pans, All Clad sauce pan, All Clad frying pans and a lot more. All Clad Outlet ensures you that all these items have been made with great effort and performance, therefore, all consumers of these brand are ensured that they are for long last. The All Clad Cookware Sale offers you with amazing All Clad stick pots which have been loved by a lot of chefs and home cooks all over America. Why is that? Because the heat coming from the electric or gas stoves is being distributed evenly to all parts of the cookware, therefore, it is ensured that the food being prepared has been cooked to perfection. No part of it is undercooked or overcooked. Your family would surely enjoy what you have cooked for them and this can be seen through their laughter, smiles and positive feedback from the meal you have prepared with absolute love and care for them. All clad seconds sale provides everyone the chance to enjoy and relish cooking with the use of brilliant pieces of cookware. A lot of people tend to choose the cookware items which offer poor quality and has been made from low end materials due to its price and now as the All Clad launches its second major sale, items made for quality and for five start hotel chefs are now available for a lower price. These items have been made from only the best materials of stainless steel and aluminum which ensures all its users that they will be stuck and used in your kitchen for a very long time and don’t worry about its performance, All clad ensures you that in very time you’ll be cooking, you’ll feel like cooking with use of brand new item and this characteristic makes All Clad cookware the best among the best cookware brand in the market. If you are targeting to attend these awesome sales from All Clad, it is advisable that you turn on your computer or laptop or even you mobile phone and tablet and start googling the nearest local store which conducts an All Clad sale. Check it regularly so you’ll get updated of the different things coming inside and out around the market of cookware industry. Keep in mind that it is only All Clad which can offer you an amazing quality and performance cookware for a lower price. So what are you waiting for? Grab your gadgets and start your search for the cookware which provides optimum service and design. 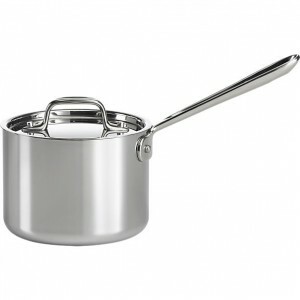 Why is it Best to get the Brand New-All Clad Saucepan? A lot of consumers today get so conscious of their health and wellness. How much calories do they get from consuming a bar of granola or eating pancakes or waffles from a nearby store? Some of them even check equipment which may come in hand for assistance in order to reduce the fat or calorie content of a certain food. Each of them has their own reason to why they do such thing, as processing of food becomes faster and the quality of it gets lower, a lot of people tend to worry that these mode of food processing result to ailment and diseases which might pose danger to their health and lives. Due to these reasons, a lot of people want to know how to cook their own meals in order to ensure that they are cooking not only what they want but they want to see to it, that they are cooking nutritious food and a healthy way of cooking with less oil, calories and fats. As health and cooking go hand in hand today, brands of cookware are now releasing their products which feature a lot of attributes which make their cookware better than the rest of the others but it is only All Clad Cookware which can assure you that there is no room for error when you use their items. The All Clad Outlet now features a newly released item which was created from their amazing craftsmanship and tedious effort- The All Clad Saucepan. This recently released product of All Clad is built to perfection and for high quality service consumers deserve. It is made from All Clad stainless steel and a five layer bond of aluminum and copper. Due to these kinds of material, this item as well as the other products of All Clad like All Clad fry and frying pans, All Clad pots and of course The All Clad Cookware Sets, have been designed to last long in the kitchen due to its durability and the manner of how they were fashioned. You can use this in every occasion you have in your home, from small family dinners or large get together events because All Clad ensures you that you’ll deliver excellent quality dishes through these items. You can sauté, fry and braise your ingredients effortlessly because the heat coming from its source is evenly distributed along the cookware’s surface to make sure that no part of the dish has been overcooked nor undercooked. The designs created and developed by All Clad are absolutely wonderful and have been made in order to assist cooks from all over the world. It features slick and non- heating handles so you can pour, transfer and grip your cookware anytime you want. Also, it is made for both oven, electric stove and stovetop cooking, it can endure up to 500 degrees of Fahrenheit temperature. Lastly, it is dishwasher safe. In terms of the latest All Clad cookware yet, All Clad saucepans come into various sizes, the All Clad 2qt saucepan, All Clad 3qt saucepan and the All Clad 4qt saucepan. From all the pieces of cookware released by All Clad, this product is the most useful to them all because it can be used for frying, sautéing and browning different dishes plus it is also widely utilized for re-heating variety of meals like vegetables, soups and a lot of other viands. Moreover, this amazing item as well the other All Clad items feature a secure fitting lid to make sure that the heat and flavor of the food swarm and cover the dish. All Clad items have always been polished to perfection from its quality service to the designs which go together with it. All Clad assures you that your cooking experience would never be the same with these amazing items in your kitchen, you’ll see that you’ll get in love with its features and the way they were made. The handles are just very easy to hold and grasp due to its holes so you can easily check the food you are cooking. Moreover, you’ll definitely applaud its polished surface from the outside to the inside of this cookware. All Clad has been able to establish a name and a bar of standard in this business. It fuses high end cooking and affordable mark down prices. It has been utilized by chefs and home cooks all over the world due to its outstanding cooking quality. So what are you waiting for? Go check out the nearest All Clad Outlet from your location or why don’t you just check the online store of All Clad to have an up close scrutiny of the All Clad cookware specifications and try to see if there are All Clad sales coming on your way for further price reductions. You can also check the All Clad reviews to see what the other customers thought of All Clad and how magical their cooking experiences now with the aid of the All Clad cookware. As cooking becomes very on trend these days due to the emergence of a lot of cooking shows and reality television cooking competitions together with celebrity chefs and cooks, a lot of people are now getting curious with the aspect of cooking. A lot of them get very interested in cooking their very own styles and versions of traditional and classical dishes, putting their authentic flavors and taste. A lot of cooks enjoy plating their dishes with various forms, shapes and colors. Due to these reasons, a lot of people tend to make their kitchen halls and rooms more creative and functional than ever and how do they do these? Of course, they make these possible through purchasing the most amazing and terrific equipment and pieces of cookware to ensure that they’ll be bringing out the best and the passion they have for cooking out of themselves. In terms of availing the best cooking pieces and cookware, you can only trust All Clad Cookware which fuses high quality standard cooking service and affordable mark down prices. All Clad has been fashioned and designed with the most amazing features and attributes you can see in a cookware from the materials used to create such item to the concepts utilized in order to maximize its cooking functions and purposes. 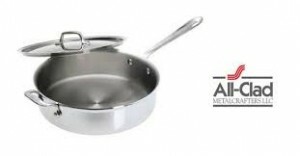 The All Clad pots are no exception to other products made by All Clad such as All Clad pans, All clad frying pans, All Clad skillets and other All Clad kitchen creations. All of them are made from high end materials of aluminum and copper to ensure perfect distribution of heat to make sure that no part of the food being cooked has been overcooked nor undercooked. Moreover, their design of All Clad stainless steel is just absolutely impeccable from the outside to the inside surface. The All Clad pots have been known for having made from the finest and highest materials to ensure its durability and for long lasting use. These pots can be used easily and effortlessly through its handles and secured lids. Through these, you can easily transfer, pour and hold the pan when cooking. You can also be sure that the dish is very flavorful because of the tightly secured lids which make sure that the fragrance, taste and the heat swarm and cover the whole lot of your meal. Moreover, they are dishwasher safe so cleaning would be the least of your problem. To ensure its durability, toughness and sturdiness, it has been made from copper and aluminum. Cooking with All Clad pots becomes more enjoyable and satisfying because of the high end quality service it offers, through these you’ll be sure that you’ll only cook the best for the best people in your life. The All clad cookware set includes All Clad Multi pot, All Clad crock pot, All Clad soup pot, All Clad fondue pot, All Clad rice pot, All Clad pasta pot, All Clad Asparagus pot, All Clad Teapot and most especially All Clad pot rack. 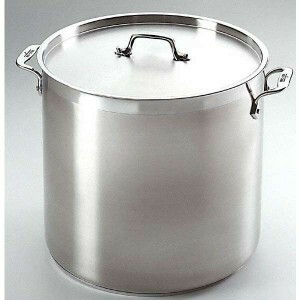 With the All Clad Tri-Ply Stock Pot, you can ensure that your stocks and soups are done to its finest quality and standard. Using this type of pot, you’ll see that there would be less evaporation to ensure the crunch and tastiness of your vegetables and soups. Also, you are expected to see that the vegetables you are cooking from this pot remains to be underwater while you let it simmer. Furthermore, you’ll have no trouble in lifting and moving your dish from one place to the other due to the long and useful handles of this pot. Mashing potatoes and cooking vegetables become more amazing with the utilization of the All Clad Multi pot. Through the included mesh, you’ll have no trouble in draining the water that comes when you cook your vegetables. You’ll see that you’ll have more fun making your own favorite versions of mash potato with this pot. Of course, the handles are always there to guide and assist you in order to make cooking more convenient than ever. If you are fund of hosting large and extravagant parties then this spectacular All Clad MC2 pot is just around the corner, it has been mainly for simmering and boiling different food and dishes. It is the most gigantic among all the pots to ensure that you’ll be maximizing and using all the space you want. Even though it is the biggest, you’ll still see that it’s still easy to carry due to the lightweight material that has been used in creating it while at the same time being durable like the other All Clad products. The long and ergonomically made handles always come very handy. All clad has been in this business for quite some time, they have developed classy and timeless products that have been used by top chefs from top hotels and restaurants all over the world. Several home cooks enjoy cooking and preparing outstanding dishes with the aid of All Clad cookware. To experience this phenomenal kitchen moments, take your time and visit online or an actual All Clad Outlet to check for the upcoming All Clad Sale and get hints from the All Clad users themselves through the All Clad review.